Much of Connecticut’s media supported Weicker during his 18 years as the state’s senior “Republican” U.S. Senator. Before becoming Senator, Weicker toiled for one term in the U.S. House vineyards. He was the large and imposing Republican politician in whose shade no other Republican afflicted with conservative tendencies could grow and prosper. Connecticut’s left of center media supported Senator Weicker, and every announcement of support was a Maginot line from which they could not in the future retreat. Albert Camus, the French writer and philosopher, used to say that every word written by a writer was a commitment. Weicker’s political career peaked before he became governor. But when Weicker imposed on a reluctant General Assembly an income tax that he broadly hinted during his campaign for governor he would under no circumstance impose – adding an income tax during a recession, Weicker said, would be “like pouring gas on a fire” – Weicker was elevated by Connecticut’s media to something resembling political sainthood. At last, Democrat moderates such as former Governor Ella Grasso had been routed, and the door had been opened to uber-liberals, progressives who later would triple the budget, increase spending threefold and bring Connecticut’s concern with improvident spending to a grinding halt. Every step of the way, Weicker was cheered on by a solicitous media. These are precisely the kinds of commitment traps that Camus was talking about. The low point in Weicker’s senatorial career was his defeat by then Connecticut Attorney General Joe Lieberman, which signaled the real and permanent break between Weicker and those in his party who had permitted themselves to be fooled most of the time. So, you want to be a Democrat, do you? Good, do it in someone else’s political theatre. We, Republicans as much as said, are tired of the show. Life in the Republican Party will go on without you. Weicker almost recovered handsomely from his shattering defeat in the Senate by a real Democrat when Lieberman was defeated in a Democrat primary by Ned Lamont, a cipher Weicker had hit upon to carry karma home to Lieberman. Alas, while Lamont won the primary, he lost the general election to the guy who had undone Weicker’s career in the Congress. 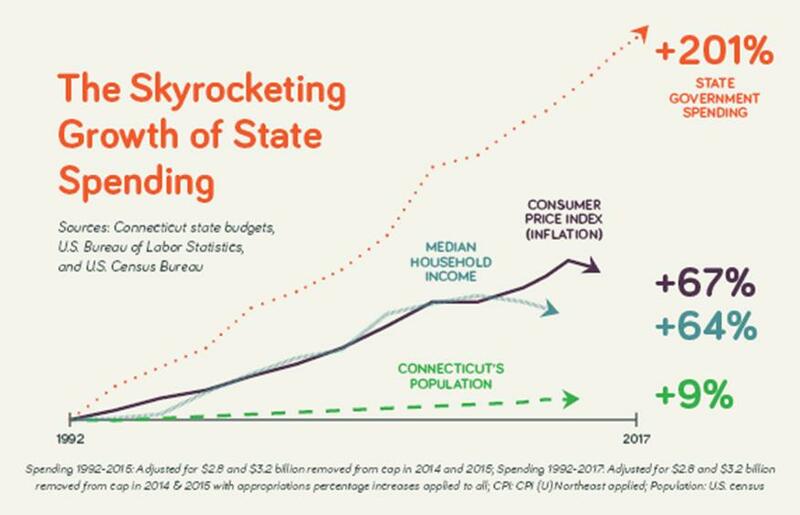 But the committed are committed still to the absurd and ruinous proposition that Connecticut is suffering from a revenue rather than a spending problem. The income tax, and other tax increases in Connecticut – most dramatically outgoing Governor Dannel Malloy’s two massive tax increases, the largest and the second largest in state history – have saved cowardly legislators the necessity of instituting long term, permanent cuts in spending. That was the unstated purpose of the Weicker income tax and Malloy’s crippling tax increases. Now that spending has tripled since the Weicker tax, now that Malloy’s two tax increases have produced more of the same – swelling pension obligations and continuing deficits – progressive Democrats in the General Assembly, who have sold the state’s birthright for a mess of state employee union pottage, are on the hunt for additional taxes to be generated by toll stations. Truly, these progressives have forgotten everything and leaned nothing. The great tragedy in Connecticut politics is how little the real stress points in the state will affect the usual endorsements of papers that in the past have, perhaps thoughtlessly, committed themselves to ruinous policies and more-of-the-same politicians. One may depend upon it: a Governor Ned Lamont will continue in the old tax and spend ways under the withering shadows of Weicker and Malloy. Yet, even so, he will garner the endorsements of much of Connecticut media, which sadly have become the prisoners of their own prior commitments. ADDENDA Hartford Courant editorial , August 5, 2018 -- "Unlike the stereotypical businessman, Mr. Lamont is progressive."